Learmonth Court is an elegant art deco mansion, set back in a quiet private road within landscaped gardens. It has the security of a resident caretaker and has lifts to the apartment, which enjoys amazing views from its 4th floor location. Perfectly situated, it is a 15 minute walk to the start of the attractions at the West End of Princes Street, a 5 minute walk to the local Waitrose supermarket and a 2 minute walk to the local restaurant and bar. It is regarded as a home from home by our guests who have rated it 5 stars and have come back year after year, loving the comfy beds, the sofas dressed with plump cushions and throws, and the well equipped kitchen. Our guests tell us how they love sitting at the bay window after a hard day's sightseeing, enjoying the view over the roof tops to the stunning Fettes college and beyond to the Kingdom of Fife. Then, enjoying a peaceful night sleep in one of the 2 double bedrooms (one of which can be made up as a twin) with its fresh white bed linen. We have now completely renovated the bathroom and kitchen, which features a twin oven and ceramic hob, along with integrated fridge, freezer, washer/dryer, and dishwasher. Overall, the apartment is furnished to a high standard with wireless broadband just another feature in the all inclusive price shown. All-in-all, you will find the apartment very comfortable - a real home from home. We welcome you and we are certain you will enjoy your stay! We are both now retired. Euan was a University Senior Lecturer in Exercise Physiology, and Avril was a Financial Adviser. The view looking north over Edinburgh onto Fettes College, and then on further to the hills of Fife, are wonderful. In addition to that, the city centre is so accessible, either by foot (15 minutes) or by using one of the very frequent buses that stop just 3 minutes away from the apartment. The bathroom has recently been completely replaced. There is constant and unlimited hot water which means that four people can shower one after the other. This is a very warm apartment, even in the middle of winter. However, there is a very effective heating system for those colder days. There is free parking for residents on the private road in front of the apartment building. Passenger and large freight lift, wheelchair accessible. The Living Room very comfortably seats four people. It has a TV, DVD player, music system, and a wireless broadband hub. For keen cooks, you will find every utensil and appliance that you would need, right down to a good set of sharp cook's knives. The kitchen has just been completely renovated with brand new contemporary grey gloss cabinets, a stunning red glass splashback, and new high quality integrated appliances. There is a dining table situated in the bay window of the living room, allowing amazing views across Edinburgh while you eat! The table very comfortably seats four, and can be extended to seat six. A Pioneer system with Bluetooth and USB connection, along with a CD player and DAB radio. There are landscaped gardens to the front and rear of the building. Unfortunately this apartment is unsuitable for very young children. There is one step at the front entrance to the apartment block, but otherwise our guests have found it to be fully wheelchair accessible. There is a rear entrance, without a step, that gives direct access from a car to a lift to the apartment for wheelchairs. My husband and I spent a lovely week in this apartment. It was our second visit and we were not disappointed. It’s very comfortable and Euan and Avril provide everything needed for an amazing stay. Well stocked, clean, and comfortable. It’s within easy walking distance to the center of Edinburgh and very near public transport. My husband and I also enjoyed some great restaurants nearby. This apartment is within 30 minutes of town. We walked back and forth every day but there are also buses that run along the main road. If you go the opposite direction of town, there is a great grocery store and yoga studio just down the road. We joined the yoga studio for the weekj and met some great people. The apartment is spacious and decorated just as the pictures show. The wood floors are very old and squeaky but that is part of the charm. The kitchen is fully equipped and the beds and living room are comfortable. Euan and Avril are great hosts. My luggage didn’t make it to Edinburough and Euan connected me with the caretaker to make sure someone was available when it arrived. We ate at several local restaurants (along the road towards the grocery store) but our favorite meal was at Howies in town. The fish of the days was incredible. We travelled around Europe for 2 weeks and Edinborough was our favorite. The people are very friendly, there is so much to do, it’s not a huge city and is easy to get around, the golf is great ( Craigielaw is beautiful) and the Highlands and castles are worth visiting. The Festival was going on during our visit so there were more people in town. The beauty of staying 30 minutes away was we didn’t notice the crowds, but could easily get to the activities. We hope to return to Edinburgh for an extended stay next year. If so, we will stay in this area again and will ask Euan and Avril if we can rent this apartment. Amazing flat has everything you need to stay! We stayed for 5 days and enjoyed every minute spent in the apartment because it is well furnished and has everything you need for living and cooking. It also has an amazing view from the windows. Location is close to center of the town and very nice to walk around. We loved to go to Royal Botanic garden and near pubs. 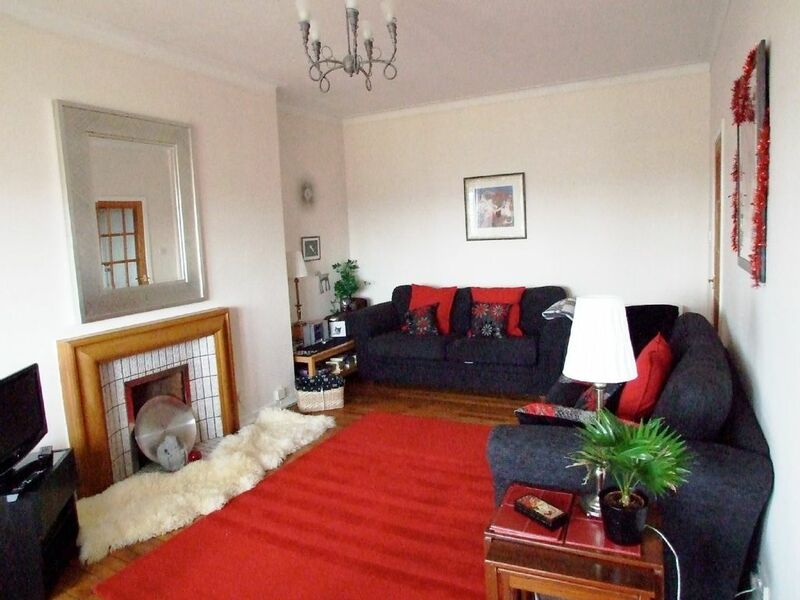 Lovely, bright, spacious flat, with easy access to Edinburgh Centre. Wonderful flat, bright and airy, in an excellent location. We easily walked to the local village of Stockbridge for groceries and dining, and the bus was a simple and short journey into city Centre. Euan and Avril were most helpful. We would definitely stay here again next time in Edinburgh. The property (EH4 1PD) is located off Queensferry Road, near to the Dean Bridge. This places it right on the edge of the New Town and a short walk to Princes Street and on to the Castle, Old Town, and the Royal Mile. The Dean Gallery and the National Gallery of Modern Art are only 5 Minutes walk and the picturesque former village of Stockbridge is only 10 minutes walk. Murrayfield Stadium is also within walking distance or a short taxi ride. Queensferry Road is the main route out of Edinburgh to the Forth Road Bridge and on to the Highlands of Scotland. There are also excellent bus links 100 metres from the apartment and Waverley and Haymarket rail stations are both a short bus or taxi trip. Edinburgh Airport is only 15 minutes away by taxi. Please note that the quoted prices are fully inclusive - there are no extra charges such as local taxes or a charge for final cleaning of the apartment. We only ask that guests leave it in the condition in which they found it. We also find that there is no need to ask for a security deposit - our guests always take care. If you only need to use one bedroom, we are happy to offer a discount.